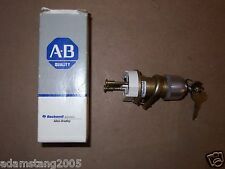 ALLEN BRADLEY - AB - 800MR-N31QB - Switch, key. Contacts: 4 Position. Switch, key. Note: Selector switch, round cylinder lock, key maintained. Key is removable only in locked position. More Information : Link. your account number during checkout. Available Carriers. SKU# SB-015673. In Box ALLEN-BRADLEY 3-Position Selector Switch. your account number during checkout. If you do not have an account No Worries! Office Hours. 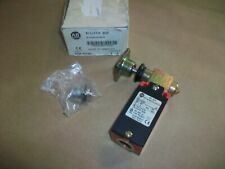 Allen Bradley Key Interlock Switch pic: 84088-90 loc: WR JULIET. No warranty beyond that. I have made an honest and fair evaluation of this item, but I am only human. We try to be as descriptive as possible for each item and represent each item in the pictures. Warehouse Location(s) If you have to get a hold of us, look us up on the net. Albion 11J2 (BOX 10). What is your phone number and extension if you have one?. 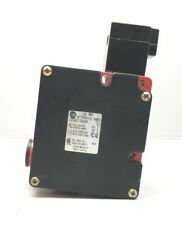 ALLEN-BRADLEY 802F-S62P2 SAFETY SWITCH. SEE PHOTOS. (CAR2-C21-1). We accept no responsibility for the correct application or installation of this item. This item is to be installed and maintained by qualified individuals. 2-Position Cylinder Lock Type. Box Condition: See Pictures. New Jersey May 1 2019. Sealed: YES. Alabama, Oklahoma, Pannsylvania July 1 2019. 30.5mm Type 4/13 Cylinder Lock PB. PUSH BUTTON DATA. Dead Bolt B - IN. LOCKING POSITION. BLOCK TYPE. ALLEN BRADLEY 2 POSITION MAINTAINED KEYED SELECTOR SWITCH. All products are sold without an existing warranty. UNLESS OTHERWISE STATED. Be sure to see our full inventory of Rosemount, MicroMotion, Yokogawa, Allen-Bradley, Endress Hauser, etc. Up far sale is Allen-Bradley key maintained selector switch. Part number 800EP-KM2303A. Up far sale is Allen-Bradley key maintained selector switch. Part number 800EP-KM23. Selector Switch With Key. Model: 800T-H31 Ser T. Model: w/800TC-XD1 Ser D. Freight can be arranged by either our staff or the purchasing party. SELECTOR SWITCH. ALLEN BRADLEY. 3 POSITION. You are purchasing one NEW. Up for sale is Allen-Bradley module. SELECTOR SWITCH. ALLEN BRADLEY. 3 POSITION. In Box ALLEN-BRADLEY 3-Position Selector Switch. your account number during checkout. If you do not have an account No Worries! Office Hours SKU# SB-115831. Lot of 2 ALLEN-BRADLEY 2-Position Selector Switch. your account number during checkout. Office Hours More Information If you do not have an account No Worries! 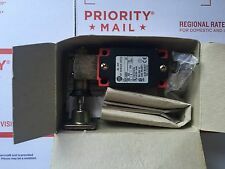 In Box 2 ALLEN-BRADLEY 3-Position Selector Switch. your account number during checkout. Office Hours If you do not have an account No Worries! SKU# SB-115834. Allen Bradley Key Interlock Switch 802F-TD6SM11 *Fast Shipping* Warranty! Allen Bradley key interlock Switch. Lot of 2 Key Selector Switches. With 1x Key. your account number during checkout. More Information If you do not have an account No Worries! SKU# SB-114997. 2-Position Key Switch. your account number during checkout. Office Hours SKU# SB-113829. KEY INTERLOCK SWITCH. PART/MODEL NUMBER: 802F-R60M2. You are Purchasing a Allen Bradley Key Switch. This item is:___________________________ALLEN BRADLEY 800T-H32A SELECTOR SWITCH 2 POS. 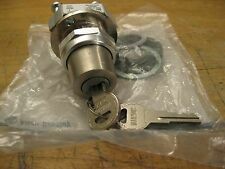 MAINT CYLINDER LOCK SERIES T_____________________________________________________. Warehouse Location:____Shelf____A73 box 1013__________________________. ALLEN BRADLEY KEY MAINTAINED SELECTOR SWITCH. NEW, old inventory. NEW, in box. NEW, no box. •Local pick up. Warranty Information 7am-4pm est. Manufacturer: Allen-Bradley Model: 440K-T11089 Trojan 5 Made In United Kingdom. We will NOT accept. There will be no. HISTORY OF. Local Pickup Available. We accept no responsibility for the correct application or installation of this item. This item is to be installed and maintained by qualified individuals. By purchasing this item you agree to hold us. 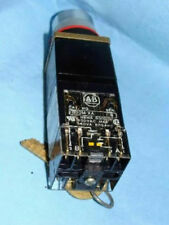 Manufacturer: Allen-Bradley Model: 800T-H32; 800TC-XD4S Ser A Missing Key. KEY INTERLOCK SWITCH. ALLEN BRADLEY. CAT: 802F-TF6SM11. We apologize in advance for any inconvenience this may cause you. The color of the photo may vary from the actual product due to translation and reproduction limitations of photography. We apologize in advance for any inconvenience this may cause you. The color of the photo may vary from the actual product due to translation and reproduction limitations of photography. AC12 250V/10A.